A very good condition 1900 Pattern British naval seaman's cutlass with leather scabbard and belt frog. 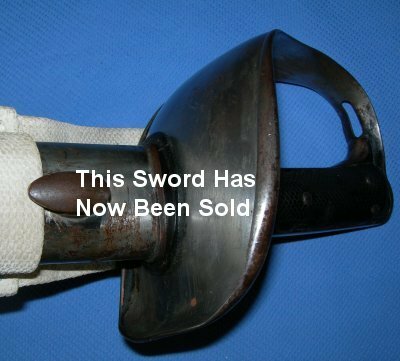 Excellent example of the 1900P British navy cutlass, made by Mole, complete with leather and steel scabbard, plus cloth frog for attachment / hanging from the sailor's belt; it is very rare to get these two "accessory" items at all, let alone in such good condition. Everything in good order, the inspector and manufacturer marked 28 inch blade is firm in the hilt, and slides firm in and out of the scabbard as good as the day it was issued. The grip is worn at the edges, but this only adds to the item as it clearly has been held in service quite a lot. Further pictures available upon request.